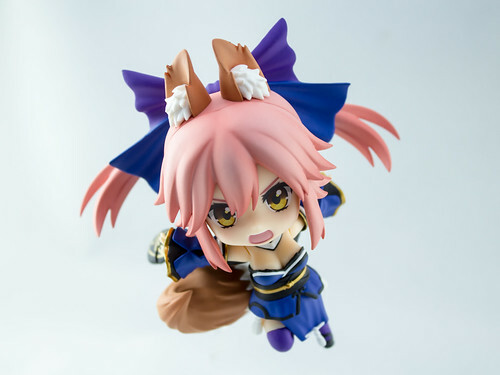 The ever-loving Caster from the Fate/Extra series, Tamamo no Mae finally made her appearance in the cutesy adorable form of a Nendoroid. 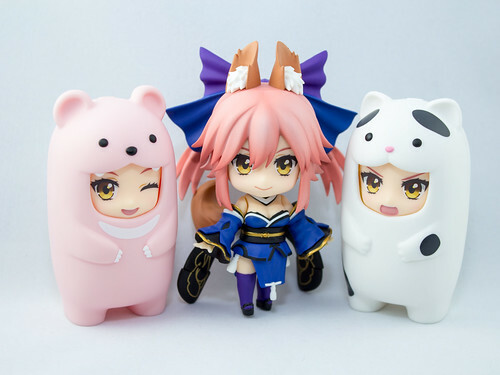 Packaged in your standard Nendo box design and format, Tama-chan boasts a number of optional parts that will surely tickle any Master’s fancy. 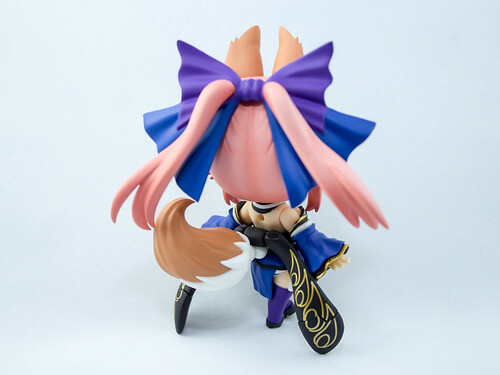 Clad in her signature deep bluish segmented kimono as well as her gigantic but girlish bow, the Tama-chan figure is pretty detailed in the application along with her eye-catching fox ears and tail. 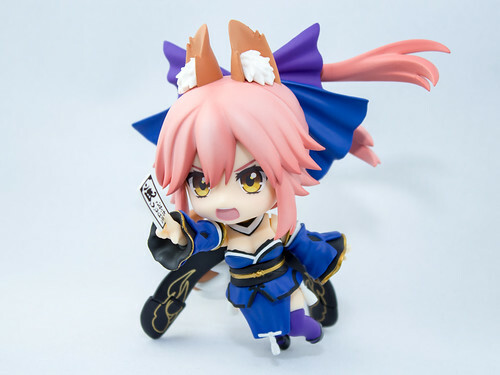 Thanks to her articulated obi (sash) and tail, she can stand nicely without the use of the given Nendo base, which is a weakness to most if not all Nendoroid figures. 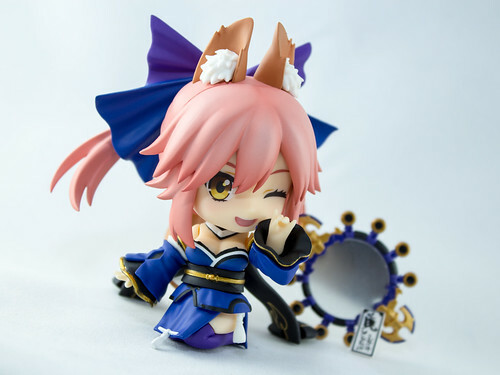 Tama-chan wouldn’t be complete without her Noble Phantasm, the holy mirror Suiten Nikkou Amaterasu Yano Shizu-Ishi. The surface of the mirror itself is just a coat of silver paint, which can partially show your own reflection unlike her Figma counterpart. 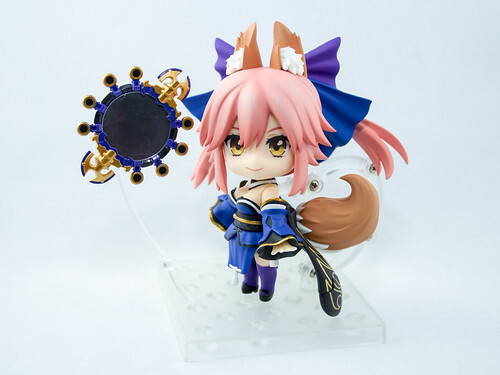 And of course a Nendo base is included as well, with a couple of jointed arms that can hold her and her Noble Phantasm in place. 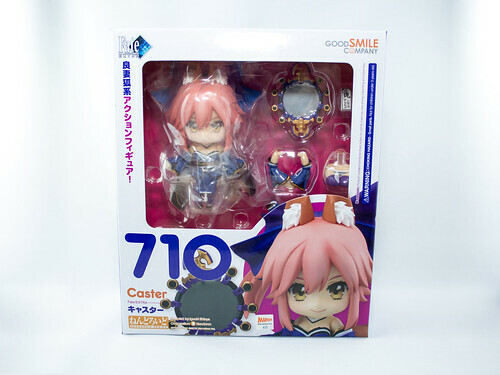 Aside from her default face plate, Tama-chan comes with a couple of extras: one with a winking smile and the other with a more aggressive expression. 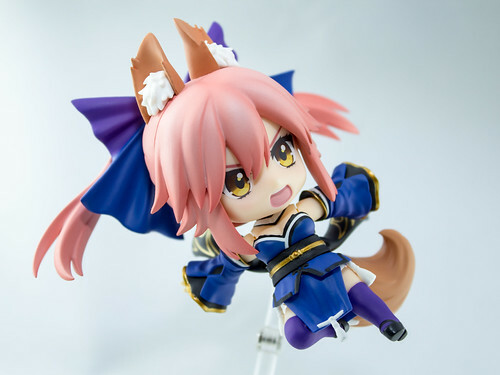 Optional arms and legs are included to allow you to recreate famous Tama-chan poses in the series. 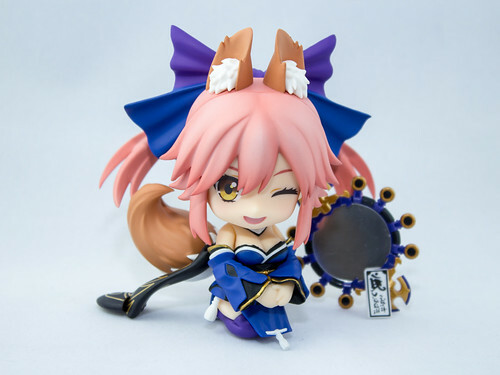 First off are the arms that mimics the adorable “Kon” hand signs signifying the head shape of foxes. XDc It’s extremely hhhnnnggg to have witness this in this chibi form. 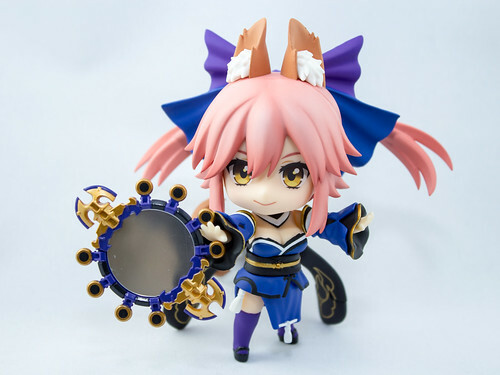 Being a Caster specialises in spells and curses imbued with elemental powers, Tama-chan comes with a right forearm that can hold a Charm, which she uses for attacks and such. 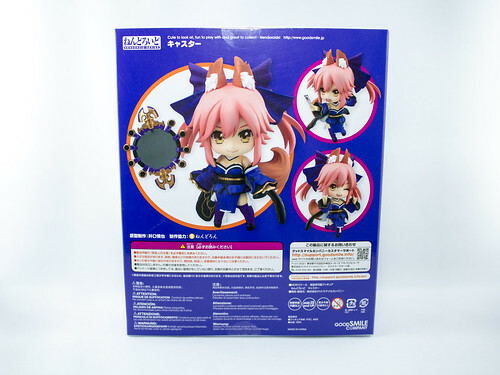 Just like her Figma counterpart, do be careful not to lose it as you only have a single of such Charm in the package. 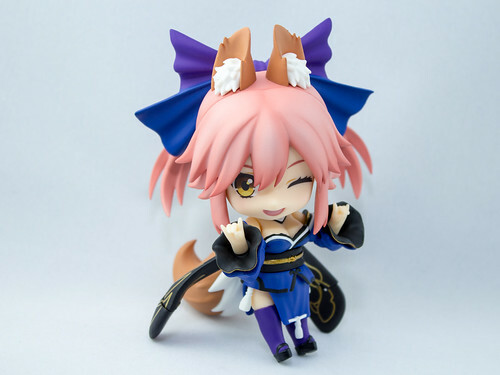 I can’t get enough of her superb kawaii-ness, especially in this kneeling seiza pose coupled with the winking face, topped with the “Kon” hand sign~! This entry was posted on 12th June, 2017 by yunamon. 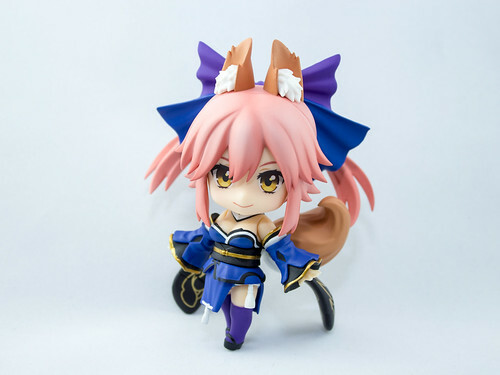 It was filed under Nendo Coalition and was tagged with Caster, Caster Extra, Fate Extra, Fate/Extella, Fate/Extra CCC, Fate/Grand Order, Good Smile Company, Limited, Nendo, Nendoroid, Tama-chan, Tamamo no Mae.